I hate to say I told you so. And I hate for the proof to be an actually jetliner falling from the sky. But for those of you who didn't know this ... the birds have declared war against us. Thursday afternoon and evening, the mainstream media confirmed that I've been telling you for months. The birds hate us for our freedoms. They think they should be the only ones able to fly ... and aren't afraid to bring a plane down as a means of letting us know. For those of you COMPLETELY in the dark, a US Airways Airbus A320 bound for Charlotte, N.C., struck a flock of birds during takeoff at LaGuardia Airport. Due to the quick thinking and calm demeanor of the pilot, the plane smoothly landed on the surface of the Hudson River and awaited the Coast Guard's rescue. All 155 passengers were rescued, most with minor injuries or none at all. 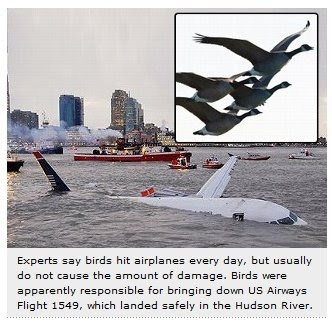 News reports were quick to find details of other instances of commercial aircraft battling it out with birds. And noting that it's not that infrequent. And it's not just the sky that the birds want to claim ownership of ... but space, too. This is such a serious problem that there's a government agency devoted to its study (hat tip, Frank). So ... NOW do you believe me? I think I might talk about this tomorrow morning. What do you think?